"Maffeo Barberini" redirects here. For his great-nephew, see Maffeo Barberini (1631–1685). Pope Urban VIII (Latin: Urbanus VIII; baptised 5 April 1568 – 29 July 1644) reigned as Pope from 6 August 1623 to his death in 1644. He expanded the papal territory by force of arms and advantageous politicking, and was also a prominent patron of the arts and a reformer of Church missions. However, the massive debts incurred during his pontificate greatly weakened his successors, who were unable to maintain the papacy's longstanding political and military influence in Europe. He was also involved in a controversy with Galileo and his theory on heliocentrism. Barberini was considered someone who could be elected as pope, though there were those such as Cardinal Ottavio Bandini who worked to prevent Barberini from being elected as pope. Despite this, throughout 29-30 July, the cardinals began an intense series of negotiations to test the numbers as to who could emerge from the conclave as pope, with Cardinal Ludovico Ludovisi dismissing Barberini's chances as long as Barberini remained a close ally of Cardinal Scipione Borghese, whose faction Barberini supported. Ludovisi had discussions with Cardinals Farnese, Medici and Aldobrandini on 30 July about seeing to Barberini's election. The three supported his candidature and went about securing the support of others, which lead to Barberini's election just over a week later. On 6 August 1623, at the papal conclave following the death of Pope Gregory XV, Barberini was chosen as Gregory XV's successor and took the name Urban VIII. Urban VIII practiced nepotism on a grand scale; various members of his family were enormously enriched by him, so that it seemed to contemporaries as if he were establishing a Barberini dynasty. He elevated his brother Antonio Marcello Barberini (Antonio the Elder) and then his nephews Francesco Barberini and Antonio Barberini (Antonio the Younger) to Cardinal. He also bestowed upon their brother, Taddeo Barberini, the titles Prince of Palestrina, Gonfalonier of the Church, Prefect of Rome and Commander of Sant'Angelo. Historian Leopold von Ranke estimated that during his reign, Urban VIII's immediate family amassed 105 million scudi in personal wealth. Urban VIII issued a 1624 papal bull that made the use of tobacco in holy places punishable by excommunication; Pope Benedict XIII repealed the ban one hundred years later. Urban VIII canonized five saints during his pontificate: Stephen Harding (1623), Elizabeth of Portugal and Conrad of Piacenza (1625), Peter Nolasco (1628), and Andrea Corsini (1629). The pope also beatified 68 individuals including the Martyrs of Nagasaki (1627). The pope created 74 cardinals in eight consistories throughout his pontificate, and this included his nephews Francesco and Antonio, cousin Lorenzo Magalotti, and the pope's own brother Antonio Marcello. He also created Giovanni Battista Pamphili as a cardinal, with Pamphili becoming his immediate successor Pope Innocent X. The pope also created eight of those cardinals whom he had reserved in pectore. Urban VIII and his family patronized art on a grand scale. He expended vast sums bringing polymaths like Athanasius Kircher to Rome and funding various substantial works by the sculptor and architect Bernini, from whom he had already commissioned Boy with a Dragon around 1617 and who was particularly favored during Urban VIII's reign. As well as several portrait busts of Urban, Urban commissioned Bernini to work on the family palace in Rome, the Palazzo Barberini, the College of the Propaganda Fide, the Fontana del Tritone in the Piazza Barberini, the baldacchino and cathedra in St Peter's Basilica and other prominent structures in the city. Numerous members of Barberini's family also had their likeness caught in stone by Bernini, such as his brothers Carlo and Antonio. Urban also had rebuilt the Church of Santa Bibiana and the Church of San Sebastiano al Palatino on the Palatine Hill. 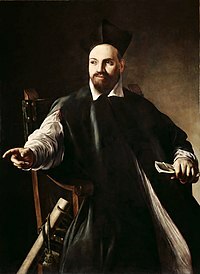 With the Spanish plan having failed, by 1640 the debt had reached 35 million scudi, consuming more than 80% of annual papal income in interest repayments. Following his death, international and domestic machinations resulted in the papal conclave not electing Cardinal Giulio Cesare Sacchetti, who was closely associated with some members of the Barberini family. Instead, it elected Cardinal Giovanni Battista Pamphili, who took the name of Innocent X, as his successor at the papal conclave of 1644. In the papal bull Sanctissimus Dominus Noster of 13 March 1625, Urban instructed Catholics not to venerate the deceased or represent them in the manner of saints without Church sanction. It required a bishop’s approval for the publication of private revelations. Since the nineteenth century, it has become common for books of popular devotion to carry a disclaimer. One read in part: "In obedience to the decrees of Urban the Eighth, I declare that I have no intention of attributing any other than a purely human authority to the miracles, revelations, favours, and particular cases recorded in this book...."
Urban VIII is a recurring character in the Ring of Fire alternative history hypernovel by Eric Flint et al. where he is favorably portrayed. He is especially prominent in 1634: The Galileo Affair (in which he made the fictional Grantville priest, Larry Mazzare, a cardinal), and in 1635: The Cannon Law, 1635: The Papal Stakes, and 1636: The Vatican Sanction. ^ a b Weech, William Nassau (1905). URBAN VIII: Being the Lothian Prize Essay, 1903. London: Archibald Constable & Co. Ltd. pp. 1–128. Retrieved October 31, 2014. ^ a b c Ott, Michael T. (1912). "Pope Urban VIII". The Catholic Encyclopedia. XV. New York: Robert Appleton Company. Retrieved 2007-09-07. ^ Keyvanian, Carla. "Concerted Efforts: The Quarter of the Barberini Casa Grande in Seventeenth- Century Rome". Journal of the Society of Architectural Historians 64, no 3 (2005): 294. ^ "Sede Vacante 1623". 27 September 2015. Retrieved 22 January 2019. ^ Mooney, James (June 1910). "Catholic Encyclopedia Volume VII". Robert Appleton Company, New York. Retrieved 2007-06-07. ^ Joel S. Panzer, The Popes and Slavery, Staten Island, New York, Society of St. Paul, 1996, pp.89-91. ^ a b van Helden, Al (1995). "The Galileo Project". Rice University. Retrieved 2007-09-07. ^ Gately, Iain (2001). Tobacco: A Cultural History of How an Exotic Plant Seduced Civilization. Simon & Schuster. ISBN 978-0-8021-3960-3. ^ Duffy, Eamon (1997). Saints and Sinners: A History of the Popes. Yale University Press. ISBN 978-0-300-09165-6. ^ Walsh Pasulka, Diana (2015). Heaven Can Wait: Purgatory in Catholic Devotional and Popular Culture. Oxford University Press. p. 127. ISBN 9780195382020. Retrieved 30 November 2017. ^ Boruchoff, David A. (2014). "Martín de Murúa, Felipe Guaman Poma de Ayala, and the Contested Uses of Saintly Models in Writing Colonial American History". In Kirk, Stephanie; Rivett, Sarah (eds.). Religious Transformations in the Early Modern Americas. University of Pennsylvania Press. p. 283. ^ Windeatt, Mary Fabyan (2013). Saint Benedict: The Story of the Father of the Western Monks. TAN Books. ISBN 9781618904614.